The best proof of a superior service or product is a “Raving Fan”, an extremely satisfied customer. Recently, Mr. Chris Horn, Home Inspector and owner of Hacienda Inspectors, LLC, gave a glowing report about the DustRam® System Equipment to the Better Business Bureau. After we contacted Mr. Horn to thank him, he kindly agreed to elaborate further on his experience in a short interview. What follows is Mr. Horn’s BBB review in italics, interspersed with interview questions and answers. Mr. Horn has firsthand advice to the homeowner seeking a fast and ultra-clean way to remove outdated tile. We just moved in to our new (to us) 8 year-old home that had about 1,000 sq. ft. of ceramic tile that just didn’t go with our décor. Knowing that it had to go, and knowing from a previous, self inflicted, tile removal job, I knew I had to find someone else to do it for me. Can you tell us about your experience removing tile on your own? I should have known better but I was too young to resist. It was 20 years ago. We pulled up the tile in the front entry of the house–only about 12 to 16 square feet. It took the whole weekend to get it all out. It was just chisels and scrapers, and all the wrong methods to do it. The dust was fairly localized, but there was stuff flying all over the place. If it had been a lot of tile, it would just have been a nightmare–an absolute nightmare. That was a lesson learned. I found AZ Home Floors/ Jack King on the net. I watched his YouTube video (dustram.com/tile-removal) & I was, to say the least…intrigued. So I called Jack for a quote. At first glance, he seemed a little pricy. But then after remembering back to my previous experience & the mess it made, I decided to go with him. 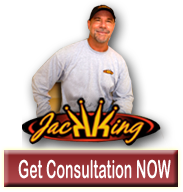 What convinced you to use Jack King’s DustRam® System Equipment service for your tile removal? When he gave me the quote for about 1,000 square feet, I didn’t really know what to expect. Jack talked about his equipment, and about how dust-free it was. … I’m 50; you don’t pay attention to this when you’re younger, but you get that little voice in your head that says: you need to go with this guy. I got an e-mail quote from another contractor. He was going to do it for $1.50 a square foot. His advertising was, “We put plastic over all your stuff.” But what about the walls and the ceiling, the fans and the A/C system, and everything else? I ended up calling Jack back and getting on the schedule. He really did jump through some hoops to get me on the schedule quickly. He [and his crew] came the day after Thanksgiving, and Saturday they got it wrapped up. The tile and concrete dust is a real health hazard, especially for those with asthma and allergies. What do you think the dust would be like with conventional tile removal methods? I’ve never personally experienced it, but I imagine it would be a lot like an Arizona dust storm. This was the best money I have EVER spent. To say that Jack & his WELL QUALIFIED team of professionals met & exceeded my expectations is the understatement of the century! Where do I start? In no particular order, Fast, Courteous, Conscientious of our home, Professionalism beyond reproach, Organized, & Clean, Clean, Clean!!! Jack’s Dustram system is a work of genius. When you say Jack’s DustRam® System Equipment is a work of genius, are you referring to how dust is controlled during every step of the tile removal process? Yes. These guys have just refined their process so much. Honest to God they left the house cleaner than they found it. How quickly did Jack and his crew do your job? They started around 7:30 on Friday morning and knocked off at 2:00 [p.m.]. By the time they were done, all of the tile was off the floor, and probably half the thinset was ground down. Then they came back the next morning on Saturday, same time, and continued grinding the thinset. They got that done, did the edges, and started the clean up. They were out by about noon or 12:30. So speed-wise, it was a day and a half for 1,000 feet. I know he advertises that he can usually do that in a single day, but if you don’t need to, why would you want to? I would rather they take their time and do it right than rush through it and do it wrong. And that is just not how these guys operate. I can tell from the couple of days I had them in my house. Do you think Jack’s price is fair? If you’re serious about having [tile removed] as professionally as possible, and as cleanly as possible–this is the way to do it, and this is what it’s going to cost. Everything costs money, and there are ways to get it done cheaper. But then in the long run, what are you going to have to do? Hire a cleaning crew to come in and go through the whole house? They’re never going to get all the dust out. You know, it just goes everywhere. This system is so refined, it leaves the concrete smoother than the builder left it & it leaves your house cleaner than they found it just by the nature of how it works. Is this statement based on your familiarity with the concrete in new home construction? Yes. I’m looking at areas in my home where Jack and his guys ground the thinset down, and I’m looking at areas where the carpet was taken out. Where the carpet was, there’s still a lot of overspray from the paint, as well as drywall mud from the drywall guy. Even though the builder’s flooring crews scraped the slab, there’s still a lot of stuff on the concrete. Jack’s crew doing the grinding … it’s like polishing the concrete down to get out all of what Jack referred to as “the contaminants”–and that’s a good way to put it. It’s a good deal (the free floor preparation included in thinset removal). [Mr. Horn is having major renovation done in his home; grinding was done only where tile was removed, and not where carpet had been]. Even the guy who is charged with picking up the tiles & carting them out is required to use a dust capturing device that prevents the dust from billowing up out of the crate that he’s using to haul the tiles out in! And it doesn’t stop inside the house. When they were out on the back patio emptying the vacuum cans out, they were even using a vacuum hose to capture the dust that would have heavily billowed out when they were transferring the dust into the carry off bags!! If homeowners knew about the benefits of the DustRam® System Equipment, would they really want to accept anything less when it comes to keeping their home environment clean and healthy? You would think not. Unfortunately, people will get into the process with someone else, have a mess all over the house, and they’ll just accept it as normal and part of the remodel. But if people could see the comparison in his video–where he shows the guys chipping at the floor, and [tile and dust] are flying all over the place, and then he shows his process–it’s just a world of difference. The most important thing to note–they did it all without beating my house to death! Absolutely AWESOME!!! What do other family members think of the DustRam service? My wife was amazed. She was truly impressed. They were going around vacuuming out the cupboards and the top of the refrigerator. … These guys were vacuuming shelves in the closet! They were vacuuming areas of the house that they weren’t even in! How long have you been a Home Inspector and how long have you owned your company? I worked as a home inspector for 13 years. I’ve owned my own business, Hacienda Inspectors, for 7 years. Other than during a home purchase, is there any other time homeowners should get their home inspected? Yes, one year after taking possession of a new home. A one year Warranty Inspection can help you put together a final fix-it list for the builder so he can come back and take care of a lot of the problems. If you don’t know what to look at, and what to check on, then a lot of things may get missed. Most of the time, this is the last opportunity to get the builder to make repairs. Do new homebuyers order home inspections? Not very many, because people think that the builder is doing everything right, and they don’t really need to spend the money on an inspection. Of course, the City inspectors are out there too. However, there are good reasons to hire your own inspector … Click here to find out why getting your own independent home inspection can protect your valuable investment for a fraction of its cost.